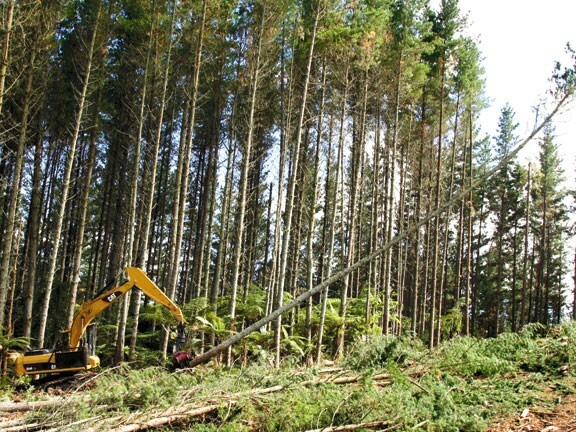 Alan Sinton owns forestry contract company AG Sinton Ltd, based in Tokoroa. With around 100 staff, he has nine gangs who work in and around the giant Kinleith forest. With 33 CAT machines, Sinton's latest purchase is a 31-tonne operating weight CAT 324D FM excavator, with heavy duty tracks as standard from the 325D model. Now approximately 33 tonnes, Sinton's Cat 324D FM excavator was three weeks old when I visited, with 129 hours on the clock. The 324D FM has a wide 2920mm FM track gauge built with reinforced steel with heavy duty track rollers, bearing and link assemblies. It also has a high 710mm ground clearance for working in rough slash conditions. A pair of 1500-litre fuel tanks were added, with additional guarding to protect them from damage. Operator Gareth Herdman says the three diesel tanks, including the standard tank, extend time between refuels to four or five days. From the seat, the large cabin has very good external visibility, thanks in part to the tall front window area, but also because of the large overhead skylight that Herdman uses to monitor the tree tops. "I like the cab, it's high and wide, the CAT always has plenty of grunt. The eight lights are pretty good early in the morning - everything is good in general," Herdman says. The controls were well laid out and simple in nature. 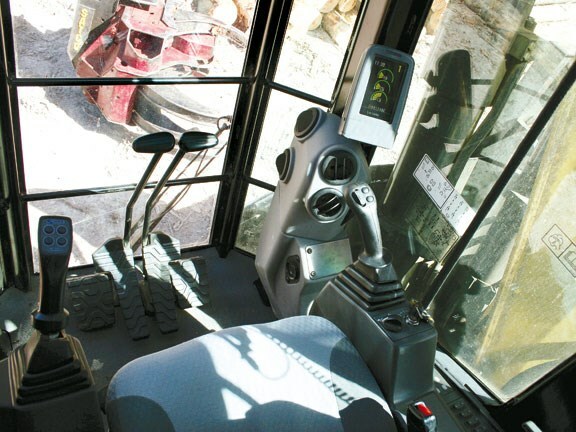 To run a SATCO felling grapple, the company retrofitted a new left-hand Sure Grip joystick with the appropriate control buttons to manoeuvre the attachment correctly. Of the square-four arranged top buttons, the top left tilts the grapple head, which falls with the cut down tree while holding it. 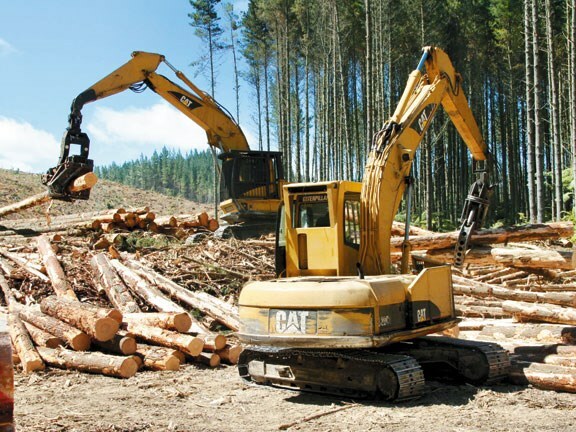 The two lower buttons open and close the grapple, to hold the tree in readiness for cutting, but also allow the CAT to be used as an occasional loader and to move the logs around after cutting. When the SATCO felling grapple is in position, the trigger finger activates the chain cut-off saw. The top right button originally activated the saw, but Herdman had it changed to the trigger, to suit him. The right-hand joystick is even easier. To complement the automatic engine power-down mode when not in use (for economy), there are two buttons on the right to manually activate the engine. Although just moving a control will do the same. The adjacent toggle switch rotates the head. To the right are two panels with basic controls, including lights, two walking speed ranges and beeping, engine power-down mode, an alternative attachment function button, and switching between the three fuel tanks. One of which is a counterweight. The right-hand "A" pillar has a decent sized colour digital LED monitor screen that, when scrolled through, shows how much fuel each tank has. It also displays revs, hydraulic oil flows, engine temperature, etc. There's a small flip-down panel at the bottom of the screen, where the CAT technician can enter all of the operating parameters, and for diagnostics. There is plenty of room behind the seat, where the air-conditioning unit is housed. Herdman says the mesh around the radiator does it's job well by keeping out the larger tree particles, however all radiators collect an element of small debris and that is where I saw the advantage of having a manually reversible radiator fan to blow out the dust. Herdman usually does this at least once a day. All of the hydraulic equipment is located close together to minimise hose lengths to retain higher pressures. The independent hydraulic pilot pump controls swing, travel and the front linkage. Powering the CAT 324D FM excavator is a six-cylinder Tier 3 Caterpillar C7 ACERT electronically controlled diesel engine. The 7.2-litre powerplant produces 140kW (188hp) at 2100rpm and 704Nm of torque at 1440rpm, via individual injectors and an electronic wastegate controlled turbocharger. The ECM electronic unit monitors the engine and machine working conditions for optimum power levels, and economy. The new fan system runs directly off the motor, its speed varies depending on a number of functions, temperatures and engine workload to cool the easy access radiators. The 324D FM has the satellite-based CAT diagnostic system so CAT staff can monitor its vital signs, such as location, fuel used versus hours worked, service hours, and a multitude of other tasks from the workshops. Gough representative Wayne Baker is a reputed expert in forestry machines. "Each FM CAT machine is spec'd with the next models track gear, so the 324D FM has the 325 heavy duty tracks," he says. 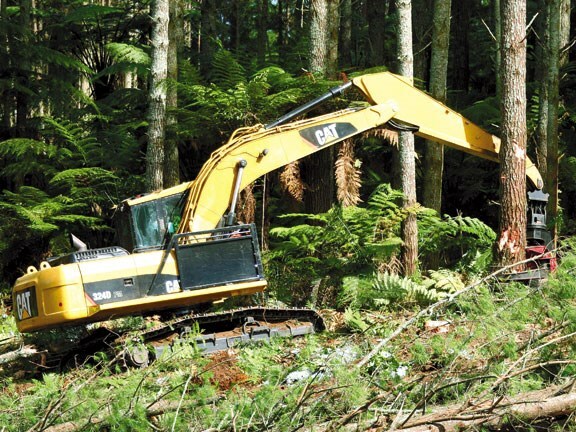 "It's designed as a logging machine and built from the ground up with the high and wide undercarriage. It has a lot more strengthening around the track frame and through the car body, and slew, and extra bossing's around the pins." 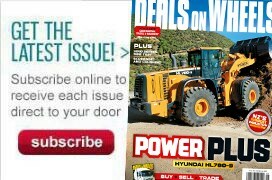 See the latest issue of Deals On Wheels magazine to read in-depth machinery reviews. See a range of used excavators for sale.